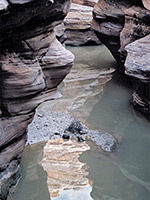 Few people visit Crawford Draw, one of the many hidden, undisturbed gorges in the San Rafael Swell. 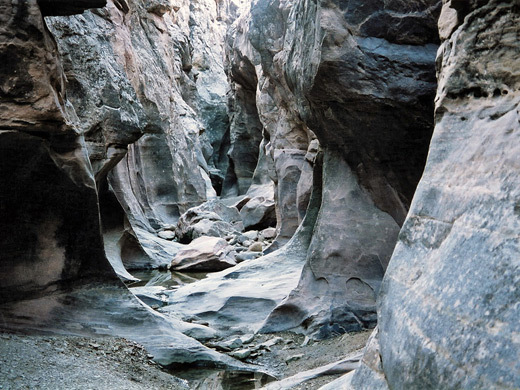 It is quite easily reached though, being just three miles from Interstate 70, and begins right next to the dirt track used to approach the canyon, a track which continues south into Sinbad Country - a wide-open isolated region at the heart of the Swell. 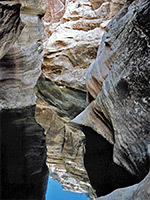 The draw has stretches of especially beautiful narrow passageways between walls of angled, subtly colored, thin-bedded strata, but with frequent deepish pools that can make exploration rather a wet experience. 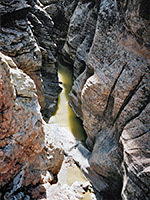 About 5 miles downstream, the gorge becomes Eardley Canyon, after various tributaries join from north and south. From I-70 exit 131, a maintained gravel track parallels the south side of the interstate for 3 miles west, passing a small reservoir formed by damming of a seasonal stream. This is Crawford Draw, which at this point is a flat, featureless wash. A little way beyond, at a cross roads, a left turn heads southeast for another 3 miles, descending into a wide, low valley formed by Reid Neilson Draw, a tributary that provides an entrance route into the main canyon and joins Crawford after 1 mile, which then runs into Eardley Canyon, passing the suggested starting point for that hike after another 7 miles. 17 views of Crawford Draw. Where the approach road crosses Reid Neilson Draw, the streambed is very shallow, usually dry and dusty, and its course is hardly evident looking away to the east but just 1000 feet along from the track, the canyon starts abruptly via a several stage drop into a narrow channel with a series of waterlogged potholes. It is best not to climb down at this point as most of the first few hundred yards seem permanently flooded, and instead the canyon can be followed by walking along either rim until the channel becomes a little wider and drier. 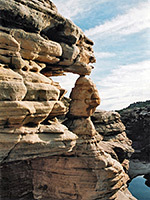 The pinkish sandstone rock (part of the Moenkopi Formation) has many thin angled layers, making the water carved formations especially attractive and photogenic. As the slot canyon deepens, the cliffs draw closer together and again there are frequent pools, some rather large but most can be bypassed by bridging above and/or climbing the rock ledges of the canyon walls then back down the far side. In places the floor drops by several feet but all such steps are easy to negotiate. Further into the narrows, the rocks become temporarily greyish, darker and more homogenous, with pebbles and boulders in the streamway, as Reid Neilson is joined by Crawford Draw from the north. 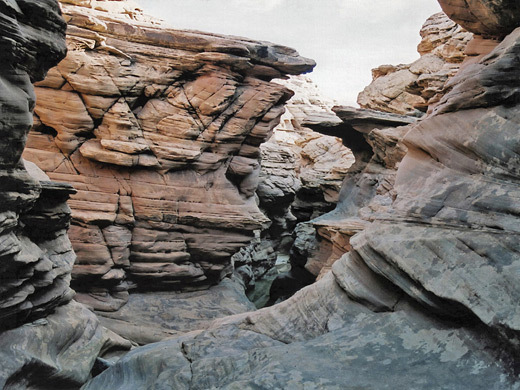 This too has a slot but a very short one, ending in several parallel branches at the foot of a small mesa, and cutting through an exposed rock plateau covered by nice red lichen and scattered quartz-like nodules. Downstream of the Crawford - Reid Neilson junction, the drainage remains generally narrow and enclosed for a mile or so, initially with a few more pools but soon the floor is dry, flat and sandy and the canyon widens very gradually. There is an entry/exit route on the south side after about 1/3 mile then various others, mostly on the north side, as the walls become less steep in places. The rocks are still impressive though, with many angled strata both inherently colorful - pinks, reds, greys - and covered by large patches of lichen with various shades of red and brown. Over the next 3 miles Crawford Draw continues to deepen and widen, and by the time it is joined by the Red Draw tributary and changes name to Eardley Canyon, the profile is V-shaped and the walls have quite a lot of covering vegetation.